Elga Medical R200 CLRW Reagent Water Purification Reverse Osmosis Clinical 350L . New Life Scientific, Inc. The Medica-R200 feeds large automated diagnostic analyzers with a guaranteed high output. This system provides CLRW standard pure water to multiple clinical analyzers across several laboratories making it highly flexible and reliable. New Life Scientific technicians were unable to fully test this equipment out as we do not have the water supply needed to properly test it. It does power on and they got the alarm for low level. (No water supply). The low level alarm stops everything else from operating. *Can feed multiple analyzers on a distribution loop and across several laboratories. *A bypass loop for continual supply of compliant water in emergency situations. *Compact footprint due to its integrated wrap around 350 liter reservoir. 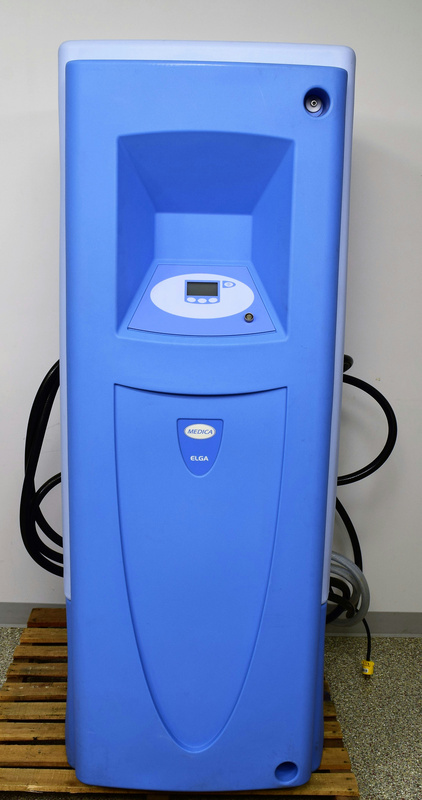 *Compatible with multiple and large clinical diagnostic analyzers which require up to 21 liters per minute of CLRW standard water. *Low running and consumable costs.